Mockingjay is the third in the Hunger Games trilogy. My review of the first book, Hunger Games, can be found here. My review of the second book, Catching Fire, can be found here. WARNING: This review contains spoilers for the first and second book! Against all odds, Katniss Everdeen has survived the Hunger Games twice. But now that she's made it out of the bloody arena live, she's still not safe. The Capitol is angry. The Capitol wants revenge. - and the districts have finally had enough. Mockingjay paints a very convincing picture of how ruthless war is. How much it costs to fight for what's right. And how you can't always trust those that promise you differently. I absolutely love the book for how brutally realistic it is. Nobody is safe. I won't say I'm entirely happy with the ending, because yes, I would have loved a fairy tale happy ending, but I admire Collins for, in that aspect, keeping it real. Even if people survive, they come out the other side scarred for life. Katniss almost becomes an anti-hero in this final book to the series. The rebels want her as their symbol, their mockingjay, but she's already endured so much and is slightly unstable, mentally. Her struggle throughout the book, not just to stay alive, but to discover the truth about herself and the people around her was once again captivating. 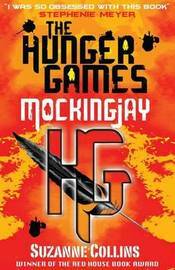 All in all, Mockingjay is not the best book in the series, Hunger Games holds that position, but it's a gripping end to a fantastic series. Hi, just wanted to stop by and say hello since you gave me a nice welcome at Book Blog. I like your blog and that series Hunger Games was awesome. I usually dont read YA but Suzanne Collins does a wonderful job with her writing.